This article has been contributed to the site by a Guest Author who does not maintain a profile on Cryptorials. The name of the author may be included below, within the body of the article. What is Provably Fair and Why Now is The Safest Time to Gamble Online. The online gambling industry is booming. Rapid technological advancements of the last decade have brought your favorite games from Casino Boats and Vegas game houses to virtual Casinos and into the comfort of your own home and pocket. Numerous advantages are driving more gamers then ever to these online gaming havens. The new decentralized currency of the internet, Bitcoin, makes it easier and more convenient then ever to bet and transfer funds online. With such an explosion in internet gambling many of you can imagine the growing trend of gambling fraud. Having no hard proof in the form of dice or card deck and no dealer to catch by the sleeve, it’s easier then ever to fix the odds in the favor of the house. In view of this the tech community came up with a magic bullet to stop gambling fraud online and give players the extra assurance that they are not being cheated. Around 2010 Provably Fair was born. In a word, lady luck. In a few, Provably Fair is a tool that lets you and Bitcoin Casinos worldwide randomize the result of each game or bet. But not only that, it also allows you to independently validate the fairness of each bet at any time. Since the entire transaction between gamer and house is being tracked and logged online, the player can verify the results with a simple click; by entering the details of the bet on the verification page the player can confirm that the transaction was indeed fair and all combinations created were completely random. This works for all types of games, cards, slots, roulette and many others. This kind of provability does not exist in a real world Casino, making Provably Fair online gambling that much more attractive. By far not all Bitcoin Casinos are Provably Fair, but this is just a matter of time. Provably Fair is that safety feature many have been waiting for and once the word gets out there will be more demand for it, just like secure shopping online, Provably Fair will become an icon everyone checks before entering their account details. I predict Provably Fair will become a must for any online gambling establishment within a few short years. To add to all the other advantages such as a low house edge and much better odds then in real life gambling, this new safety feature is what ties it all together. How does Provably Fair work? Provably Fair systems work based on cryptographic hash functions. Data is converted into a hash string which can be verified with an algorithm. If there was any tempering with the game the hash will not be verified. Here is an example from CryptoGames, a fun, flat styled Bitcoin Casino offering the latest in online gambling. CryptoGames offers it’s clients four games to choose from, Dice, Slots, Wheel of fortune and Minesweeper. For added security and convenience they use the Provably Fair platform and a cryptographic coding algorithm SHA256 (An algorithm designed by the National Security Agency) to make sure every gamble you make is randomized and fair. First, you can go to the Randomize link at the top right hand side of the page (inside Account menu). You are then shown three values, the current server seed, a random number the Casinos server comes up with, a client seed the random number your own internet browser generates. 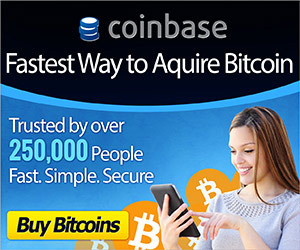 The third value is the Nonce, a number made by combining Client Seed + Server Seed. This number increases by 1 every bet. This transparency is needed to make sure these values can not be changed later by the Casino or the player. SHA256 takes these values and hashes them into a combination called the secret. 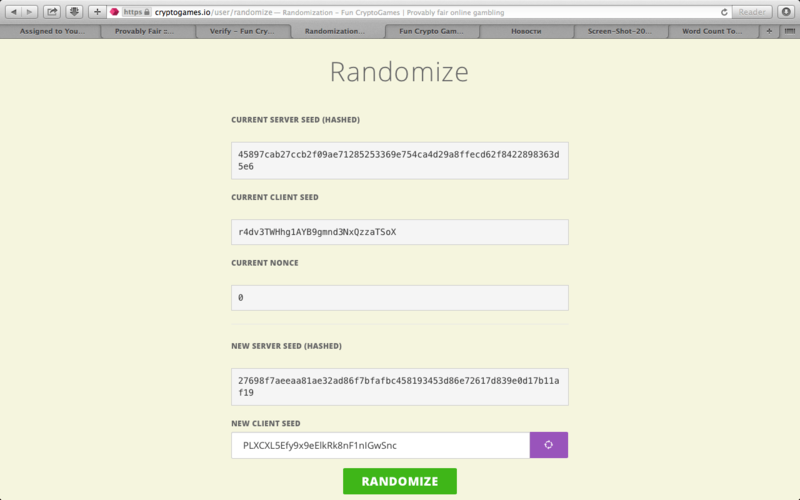 You can hit the Randomize button and a fresh code will be created. The outcome of the next 5 bets you place are based on this secret number, that has just been generated by you. CryptoGames generously provides you with a faucet, a few free Satoshis’ (like real life pennies) to get you started. Let’s say you choose to try your luck on their Wheel of Fortune. A list of tiles is generated in the order they appear on the wheel. A new random stop wheel location is chosen using the Mersenne Twister pseudorandom number generator (https:// en.wikipedia.org/wiki/Mersenne_Twister). The player places a bet and hits the spin button. Did you win? Congrats! No? perhaps you are thinking, this is a swindle! I’ve been had! Wait, let’s just check. In order to reveal the original values you will have to go to the Bet History link at the top of the page and click on the Bet ID. The original values are then shown to you along with the hash. 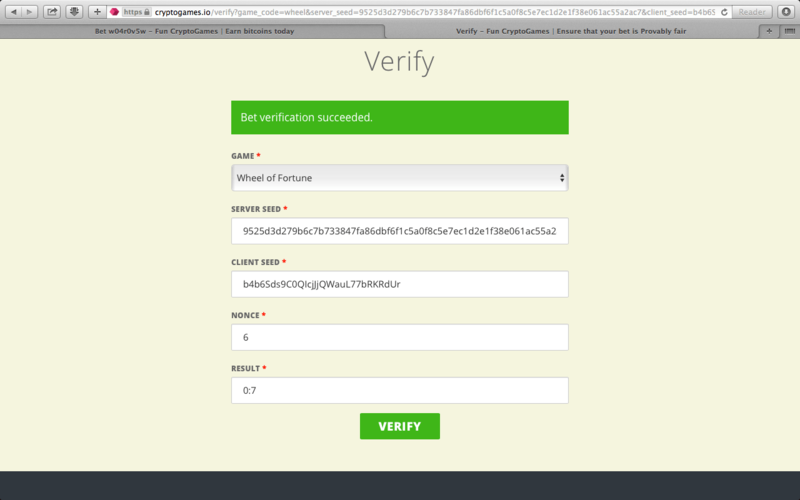 At the bottom of the page you will find a verify link, click on that and you will be taken to their Data Verification page. All the details of the bet are clearly visible before you. You should make sure the Server and Client Seed displayed before you are the same as from the randomize page. Now hit the Verify button. As you see the result is confirmed. With this novel way of checking the fairness of each transaction there is no need to worry about the Casino manipulating the outcome in any way. This doesn’t just work for their magic roulette. CryptoGames claims that all their online games are verifiable and 100% Provably Fair. Provably Fair implemented properly provides the user with the confidence and security to know that each transaction is fair. CryptoGames uses a number of cutting edge security tools to ensure clarity and transparency of each transaction making it safer then ever to play. I will even go as far as to say your transaction is more secure and more fair then in a real life Gaming house, because machines unlike us humans are incorruptible. I’ve never had any luck gambling with bitcoin, I remember when I first got my Bitcoins about 3 years ago. I bet my last 2 Bitcoins at Satoshi bet and won! That was a hell of a sweat! Other than that I think I have just lost Bitcoin.